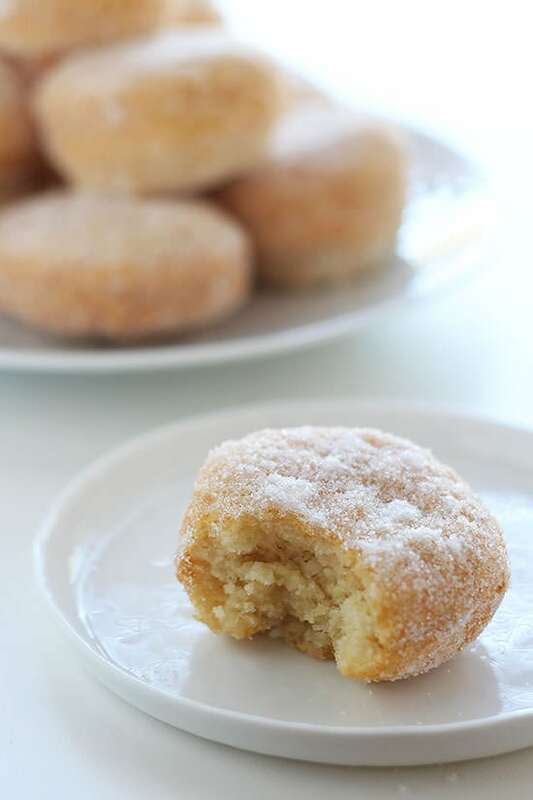 This Homemade Chinese Doughnut recipe is reminiscent of the ones you get from the Chinese buffet dessert table but made from scratch in less than 1 hour. Taste: Sweet goodness. Since the doughnuts themselves aren’t very sweet, the sugar coating isn’t too cloying, promise! Texture: Perfect crunchy sugar coating and golden brown doughnut crust outside plus the tender and delicate inside is pure texture heaven. 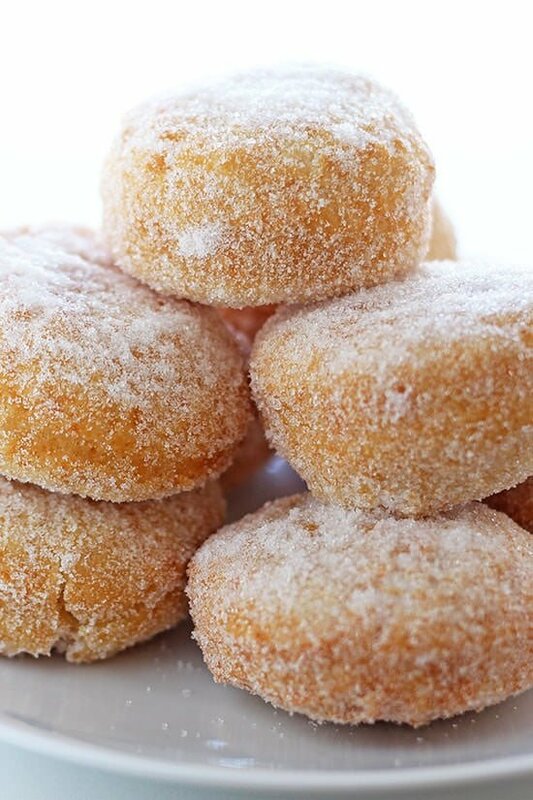 Ease: Homemade doughnuts in less than 1 hour?! You will make a bit of a mess but this recipe is otherwise super simple. Pros: Quick, homemade, and delicious copycat recipe. Will totally satisfy your craving for those Chinese buffet-style doughnuts without actually having to step foot into a buffet. Cons: Very rich and indulgent. Would I make this again? Mmmhmm. My grandpa, my dad’s dad, LOVED Chinese buffets. I could never understand why whenever we tried to organize a family dinner his first choice, and subsequently the place we ended up at, was almost always a Chinese buffet. Even for special occasions! Whether it was the food or the senior citizen discount he received, I will never know. Sadly he lost his battle to leukemia January 1st 2015, which was a rough start to the year for us. Those little things about him, like the fact that he loved Chinese buffets or that he was the only person to still call me “young lady” seem to stand out the most to me still. Randomly last week I had a strong craving for Chinese doughnuts, the ones that seem to be in the dessert section of every Chinese-American buffet. I have no idea just how traditional or authentic these are to actual Chinese culture, but it was the only reason my brother and I were willing to make so many family trips to Chinese buffets as kids. We LOVED those damn doughnuts. Who wouldn’t? Fried balls of dough coated in sugar? It’s a kid’s dream, and apparently still my dream dessert to this day. So I decided to make them at home. These doughnuts are ridiculously good. I mean, it’s just pure decadence so how could they not be incredible? Jared and I discovered a way to make them even more indulgent in the best possible fashion – they happen to taste fabulous with ice cream! This recipe basically takes a biscuit dough variation and deep fries them, finishing with a generous sugar coating. All the recipes I found online for homemade Chinese doughnuts used those premade refrigerated tubes of biscuit dough, but I wanted a homemade from scratch version and I’m thrilled with what I was able to come up with! The exterior crunch is marvelous, and the inside is soft, tender, and fluffy like a cross between a biscuit and a doughnut. I will say that the inside isn’t quite as light and fluffy like the buffet-style biscuits I remember, but it absolutely satisfies the craving nonetheless. A quick recipe note, be sure the doughnuts are cooked all the way through before coating with the sugar. You can use a cake tester or toothpick to check. During my last little batch of frying doughnuts the oil had dropped in temperature without my noticing and those ones ended up a little doughy in the middle. Pour 2 inches of canola oil into a heavy bottomed pot with a deep-fry thermometer attached. Heat to 350°F. Meanwhile, in the bowl of a food processor, combine the flour, sugar, salt, and baking powder. Add the butter and pulse several times to cut the butter into the flour until the mixture resembles coarse meal. You can also do this by hand with a pastry blender. Stir in the milk until combined. Turn the dough out onto a floured surface and dust the dough with flour. Gently pat the dough out until it’s a 1/2-inch in thickness. Use a 2-inch round biscuit cutter to cut out circles. Fry the doughnuts a few at a time, being careful not to overcrowd the pot. Fry until golden brown and cooked through, about 2 minutes per side, being careful not to let them burn. Let drain on a paper bag (or paper towels) to soak up the excess grease. 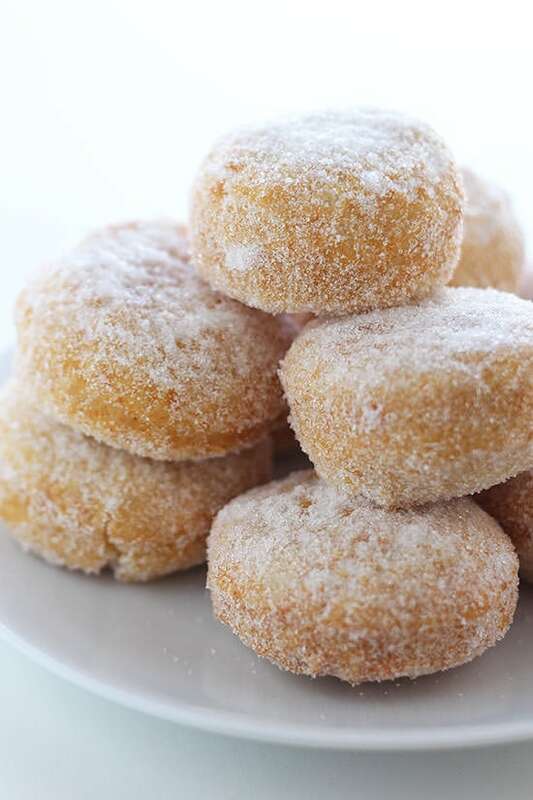 While still hot, generously coat each doughnut in granulated sugar. Serve. Doughnuts are best served the day they are made. Hi – your recipes made me a hero at Christmas Time! 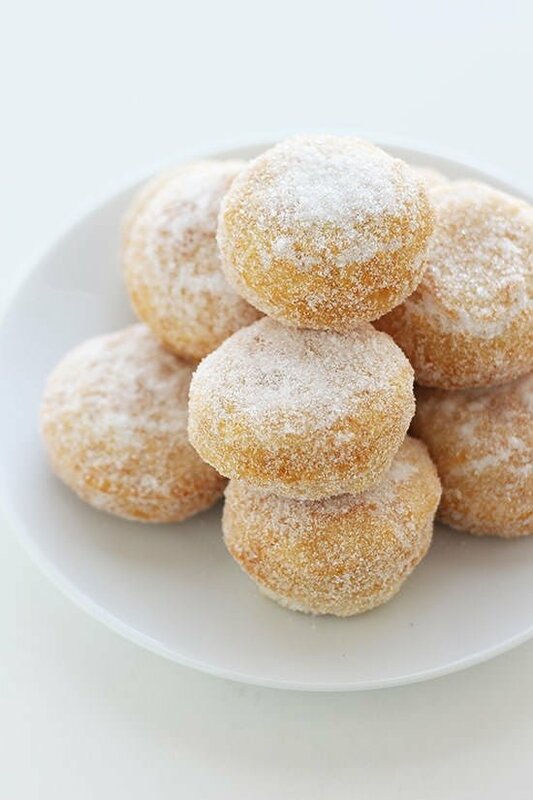 On the Chinese Donuts recipe, you say to put the flour, sugar, saly, etc. in the food processor. I assume you mean salt? Thanks for your excellent blog! I’m very sorry for the loss of your grandfather. I LOVE chinese buffets too (good ones!) even for special occasions…. 🙂 I have never thought of making chinese donuts before. Thanks for the recipe and the great step-by-step guide! Hi Tessa, deepest sympathy to you and your family for your loss. I love these donuts, tried to get one through the monitor! That’s how great they look. 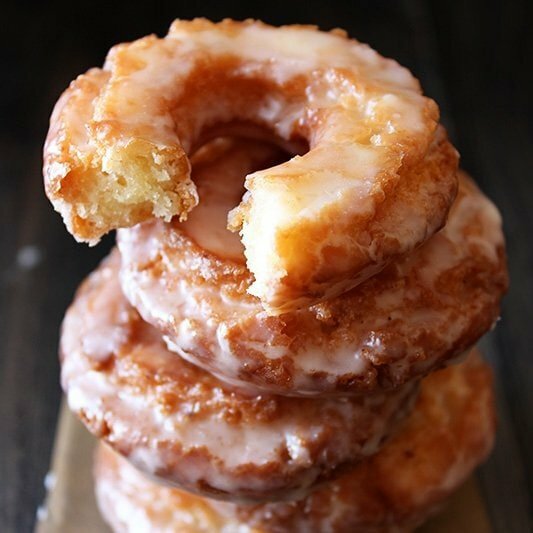 Pinned these and your Old Fashioned Sour Cream donuts, which are one of my favorites. Thanks so much! So sorry for the loss of your grandfather. He sounds like a special man. Hmm, you said these weren’t quite as light and fluffy as the restaurant version, do you think increasing the baking powder would help that? I’m excited to try these, they were always my favorite part of chinese buffets as a kid. I meant that they’re not as quite as light as a yeast raised doughnut, which is what many people think of when they think of a doughnut. These are more more rich. I would be cautious about using any more baking powder as you might start to develop a bitter, metallic taste. My grandpa loved chinese buffets too! My dad, grandpa, and I would always go together. Such good memories. Love these donuts! I’m excited to make them for my dad. Thanks! I ran across your recipe today while scrolling through Pinterest. I thought you’d be interested to know that yes – this style of food is authentically asian. I have a Chinese cook book that is written in traditional Mandarin and sold in Taiwan. They just refer to them as sugar coated puffs. Their recipe only uses flour, water, salt, and eggs for the batter. They serve them w/ just sugar, or with jam/jelly. I look forward to trying your recipe, to see how it compares. Hi I just tried the recipe and for some reason when I added the milk it was too doughy. it’s very humid which many think messes up exact recipes. I did add about a tablespoon more flour which helped. these are amazing and soo GOOOD,. I did sorta burn a couple but that was because I was running low on oil at the end and didn’t add more or was playing with the setting on the stove. Hello, thanks for the amazing recipe! Tried it at home. I do have a slight problem though, my doughnuts were pretty doughy on the inside.. how do I rectify that? How many calories do these donuts have in them??? Do you have to use canola oil or is veg oil or evoo okay? Canola or vegetable oil, but definitely not olive oil. 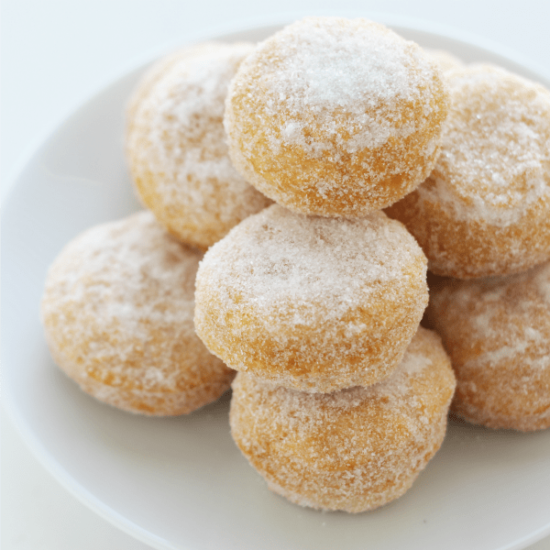 Donut holes serve a great purpose…holes help the donut cook all the way through. Testing the oil temperature with the holes first is also a great benefit. Do you need to use whole milk, or would a lower percentage work? These donuts don’t need eggs?! Can these be baked rather than fried? Not really, they’ll basically just be sweetened biscuits if you bake them. I tasted these and they are fabulous,can you say something back? Hi I’m going to be making these donuts for a history presentation. I was wondering if you knew how many calories and sugar grams is in this, thanks! Is it possible to use cashew milk instead of whole milk? I love this recipe!!! … I haven’t actually made it yet, but it’s very high on the list! I’m very excited that I can make doughnuts without a deep fryer or a special pan or something (and I looooove sugar doughnuts!). I have a question can you use water instead of milk if you don’t have any at the moment? It’s worth the trip to the store to get milk for this recipe, they definitely won’t be the same with water. Am I blind? I don’t see flour listed in ingredients. Chinese restaurants in my area used canned biscuits. I always wondered how they made them and watched them one day. They buy the pillsbury brand small biscuits. Deep fry and roll in sugar. I like your version though. I know what’s going in them! Thanks for sharing your recipe! I am so sorry for your loss. I love these, too. 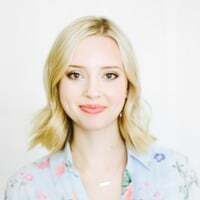 I have developed a dairy allergy and Interstitial Cystitis which limits my food selections. Would it be okay if I tweak the recipe? Thank you, Karen. I’m not sure, I’ve only made the recipe as written. If you tweak it let me know how it turns out! Just made one and it fell apart in the pan. Big disappointment. So I rounded out the rest to be smaller balls and they cooked on the outside faster and they’re dark with one half falling apart. I put th dough in the freezer to freeze it. I’m very disappointed because I was trying to make these real quick as something to snack on while making shortcake. It’s like as if I’m better off buying canned biscuits from the store. Hopefully this chilling the dough method works. ……. Hi Danielie, are you gauging your oil temperature with a thermometer? Sounds like the temperature was off. Hi Tessa, fast question, there is any problem if I use salted butter for these ones? Love you blog with my heart and soul! Great story! I had an aunt like this. They knew her name. if she did not finish her food she would sneak it in her purse. they would try and catch her,ha! Anywho…the Chinese lady said they were Pillsbury biscuit…even easier. I followed the recipe to the letter and only ended up with a heavy fried dough ball. How disappointing? At the very least, I was hoping for a more doughnutty texture. What’s worse, is they didn’t look anything close to what you’ve pictured. What if I don’t own a food processor? I feel like soooo many recipes have this step, and a lot of people don’t own a food processor. Thanks! You have to scroll through oh.. Idk, 15 paragraphs of nonsense to get to the actual recipe which in itself is just a good way to end up with hardened lumps of charred dough. If you fry these at 350 for 2 min you won’t end up with light fluffy sugar donuts. You won’t be able to bite into one without breaking your teeth. Keep the oil at 180, no higher than 195. For 2 min. You have to scroll through oh.. Idk, 15 paragraphs of nonsense to get to the actual recipe which in itself is just a good way to end up with hardened lumps of charred dough. If you fry these at 350 for 2 min you won’t end up with light fluffy sugar donuts. You won’t be able to bite into one without breaking your teeth. Keep the oil at 180, no higher than 195. For 2 min. If any of you had actually made these donuts instead of just stroking her ego pretending you actually made them you would have found out. can i use buttermilk instead of real milk? Should Nick the very sympathetic (read pathetic) commenter visit this page again, maybe it is because you cannot properly read or you are just plain dumb or probably both, a word of advice to spare yourself more embarrassment which could be handy in real live situations; before spewing such kind words on other people’s blogs, pause and check, than check again and use those little grey cells…than just keep your comments to yourself. Sorry couldn’t help myself people like Nick just piss me off. Thanks to you Tessa for your great recipes. I don’t own a food processor, can I mix with a wooden spoon or with kitchen aid? Lula, I would use a pastry cutter or two forks and just mash it up real good. Make sure the fat is cold, though. On a side note, I noticed that this was pretty much a biscuit dough that gets deep fried so I tried using some of the ‘blue can’ biscuits from the grocery store and it worked pretty well! It wasn’t as good as from scratch but if you’re in a pinch or just feeling lazy it’s a good shortcut! Can these be made in an Air Fryer rather than fried in oil??? They sound scrumptious! No, not traditional. Good lord are they yummy!, but not traditional. Chinese cuisine tends toward honey and fruit; white refined sugar is something adopted across the Asian map to appeal to western palates (as are most candy-sweet sauces you get on Chinese-American buffets).That said…I’m looking forward to trying the recipe! followed instructions to get the free download for your top 5 donut glazes, but I haven’t received it. Shame, I was looking forward to experimenting. Tried to make this recipe not once but twice both times the dough didn’t cook in the center. Additionally, they looked nothing like the picture. The dough cooks too fast on the outside. I did gauge the oil temperature and still didn’t work.This recipe was a huge bust for me. Sadly now I am out double the ingredients. could I use water instead of milk and could I use salted instead of unsalted butter?